Does your dog see an open door as an invitation to take off on an adventure of a lifetime? Having a door darting dog can be a scary and stressful thing, especially if they ignore you when you try to call them back. It’s terrifying to imagine what could happen if they run into a busy road, or get lost in the great outdoors. Fortunately, there are simple things you can do to prevent door dashing behavior and great training cues you can teach your dog instead! Your dog might door dash for a variety of reasons: lack of physical and mental exercise, their prey drive kicks in when they see a squirrel run by, or they want to go explore the big wide world. Intact male dogs have an instinctual drive to roam. Some dog breeds are predisposed to want to wander, such as Hounds or Hound mixes — they just want to follow their nose! Nordic breeds, like Siberian Huskies, are bred as working dogs who can run all day; they tend to be much more independent and want to go off on their own adventures. But any dog, no matter their breed, might have the inclination to dash out the door if the opportunity arises. Doorways are exciting places! It’s where we come in after being gone all day at work, it’s where they have to be to go outside for a walk or a game of fetch, guests enter through your door when they come to visit; going through doorways predicts lots of good things for your dog. Rushing through an open door is extremely self rewarding, so if your dog is successful, they are more likely to do it again and again. Dogs that dart out the door are more likely to be hit by cars if they wander into roadways, can get lost, or get into trouble with local wildlife or even other dogs. (We hope it never happens to you, but if your dog does dart out the door and become lost, use this customizable Lost Pet Poster Template to post around your neighborhood.) To keep your dog safe, it’s important that you address your dog’s door dashing behavior before the unthinkable happens. Your first step is setting up the environment to prevent your dog from ever being successful in bolting out the door. Dog gates are an excellent management tool to make sure your dog doesn’t have access to the doorway. You might have seen the double gate entrances to dog parks which help prevent dogs from escaping, and you can set up your home the same way. Block access to the entryway of your home by the front door and all other doorways that your dog might escape through, such as the door into the garage, or the back sliding door. If your home setup doesn’t easily allow the installation of dog gates, you can use free-standing gates or something as simple as dog exercise pen panels to block off doorway areas. If you opt not to use or are unable to install space management tools like gates, make sure your dog is on leash under your control, crated, in their puppy zone, or in a different room with the door closed whenever you open the door. Now that you've gotten your home set up as best you can to prevent your pup from bolting out the door, it's time to get down and dirty with the training aspect of door dashing. It's up to you to teach your dog what you want them to do at the doorway instead of rushing outside. And while you're at it, you should also be practicing your dog's Come cue, in case they do happen to door dash and are outside off leash. A reliable recall can save your dog's life! I absolutely love this behavior at doorways because you can start training it without food treats. Your dog will learn that if they sit politely at doorways, the door will magically open for them! In order to get what they want — in this case going through the door — your dog must sit and stay until you say it's okay. This simply takes some patience and consistency on your part. Step 1: At every door, ask your dog to sit. This can be done with a verbal cue of "Sit", prompting them to sit with a hand signal or lure, or just waiting until they offer a sit on their own. If it is a door with outdoor access, have your dog on a leash for safety. In my video example below, my foot is through the loop of the leash. Step 2: Once they sit, start to slowly open the door. Don't open it too quickly or too wide; start easy! Step 3: If they move out of their sit, the door closes (consequence of moving too soon = they lose what they want). Help them reset back into the sit position and try again, making it easier this time by not opening the door as wide or waiting too long before release. Step 4: If they can hold that sit for a couple seconds as you start to open the door, say "okay!" and allow them to go through the doorway with you. This is their big reward! Lots of verbal praise and petting is great, too, if your dog enjoys it. 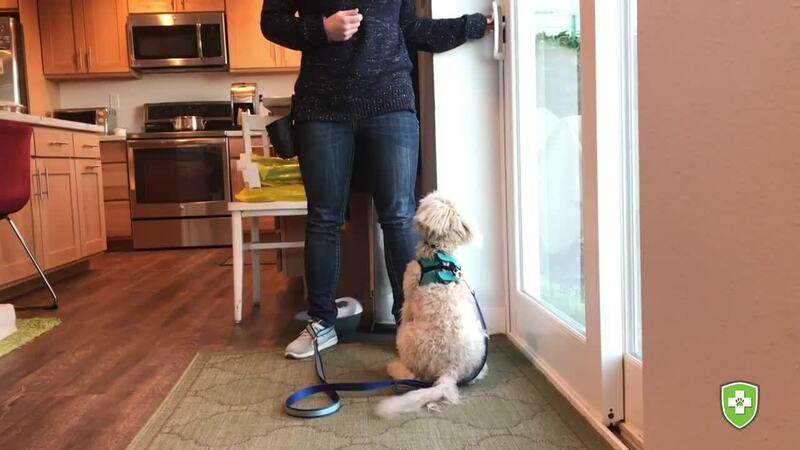 Step 5: Slowly increase the amount of time your dog has to wait, and the amount you open the doorway as they hold their Sit and Stay before releasing with your "okay!" Pro Tip: Practice this at every doorway to help your dog generalize this behavior. As you and your dog practice this behavior, you'll notice that your dog will start to sit at every closed door they encounter. They'll think they have a magic power of making doors open simply by putting their rear on the floor! This great video by Dogs Trust Dog School also shows how to teach your dog to wait calmly at the door. This is a fantastic behavior to teach a dog that likes to door dash; your dog learns to not cross the boundary unless given permission, which means they would stay inside whether or not you are physically present. While it may seem like a daunting task, this behavior is all about reinforcing your dog's choice to stay behind the boundary line. Plus, you can use this training for more than just your door. My dog has learned to stay out of my kitchen using an invisible border. Teach your dog to stay in the back of your car while you open the hatch or side door, teach them to stay out of the dining area, or out of a particular garden bed — the options are endless! Watch this video by Kristin Crestejo for instructions on how to teach an invisible boundary. Teaching your dog to go to their bed on cue (or "go to place," or "go to mat") is useful for a variety of situations beyond just door dashing. It's great for keeping your dog from jumping on guests, preventing them from being underfoot in the kitchen while cooking, and settling in their designated spot gives them something to do other than beg at the table while you're eating dinner. You can substitute a crate or other kind of "place" for an actual dog bed, like a yoga mat or rubber-backed bath mat that is easy to bring with you to lots of different places. I like bringing my dog's mat with me to coffee shops or local breweries that allow dogs so she has somewhere familiar and comfortable to settle while I hang out with friends. Once your dog has learned this behavior, you can start adding in the distraction of staying on the bed while you open the door. Once you've implemented proper doorway safety setup and trained your dog on what to do instead of dash out the door, you'll see incredible improvement and can have more peace of mind that your pup won't dart outside and get hurt or in trouble. Ask training questions and share your progress with us by leaving a comment below!